No matter how much of a minimalist you are, there's always a need for just a little more storage space. Clutter is extra noticeable when you live in a tiny home, so it really pays to have a few clever places to stash your things! 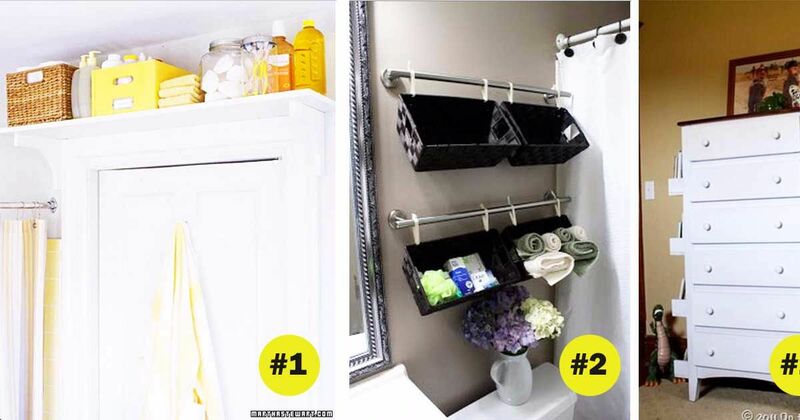 You might be a storage whiz already, but you can probably make space for at least one of these genius ideas. Even if you think you've maxed out all the available room in your home, you might be pleasantly surprised! 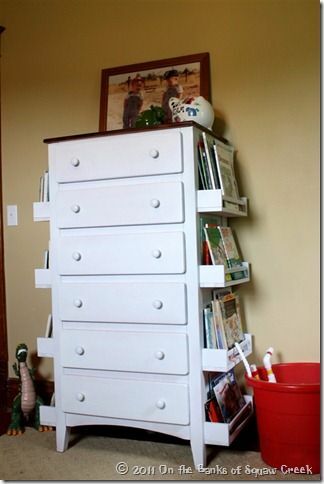 Dresser drawers are a great place to store things, but most dressers have two free sides that might as well be used. Install some slim shelves, and you have a great place to store books or any other small items cluttering up your home. This shelving from On The Banks Of Squaw Creek was made from Ikea spice racks, so it's inexpensive and easy to DIY! If you don't have enough room for shelves above your toilet, you might be able to squeeze in some hanging baskets like these ones from Simply DIY 2. 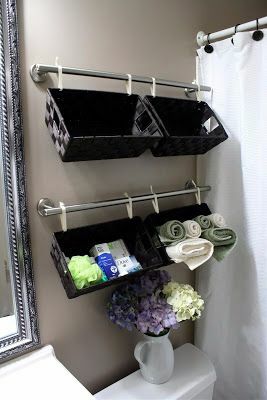 They're simply made of baskets hung on towel racks, and they hold more stuff than shelves do while taking up less space! 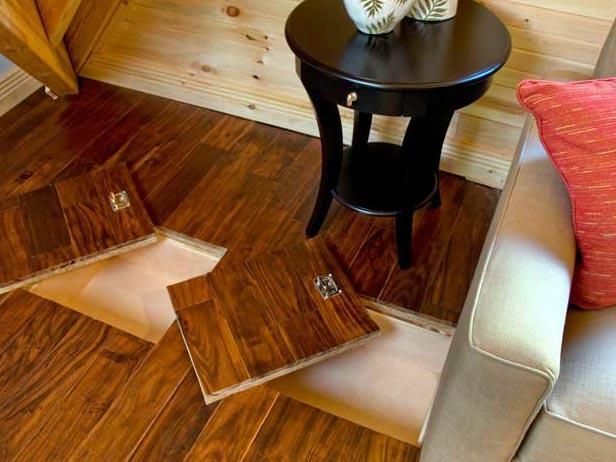 This clever under-the-floor storage solution will save the day when you think you've absolutely run out of room. Anything can be stored under here, but if you have kids it makes for a fun 'secret' hiding spot for their toys! You can learn how to make it on the DIY Network. If your wardrobe space is lacking, use this handy tutorial from Mint Love Social Club to transform a corner of your room into a makeshift closet! It's a great way to keep long clothing up off the floor and out of the closet, and it can even make for a pretty display. This shelf from Martha Stewart is a great way to add a bit of extra storage to your home, and you won't even notice it's there as long as you're shorter than your doorway. 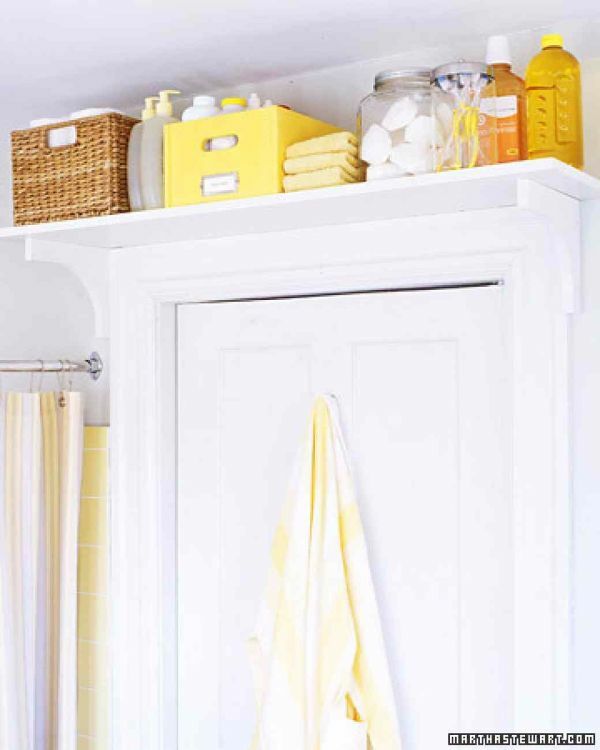 Martha suggests putting the shelf above the door in the bathroom, but it would be a handy addition to any room. Build one in your bedroom to store books, or install one in your kitchen to hold infrequently used cooking equipment! Having to keep a broom in the corner of your kitchen can be irritating, but you can get it out of the way with this clever recessed cabinet from The Craftery. The cabinet only needs to be a couple inches deep to be useful, and you can use the space to store other cleaning supplies as well.